Located in Kahana between Kaanapali and Kapalua, Kahana Villas is near shopping, dining and Pohaku Park aka "S Turns" where you may see turtles, enjoy snorkeling, surfing and stand up paddle fun. Kahana Villas resort complex is located at the north end of the famous Kaanapali beach and close to the historic Lahaina town. The ocean and breathtaking views of Lanai and Molokai are just steps away. 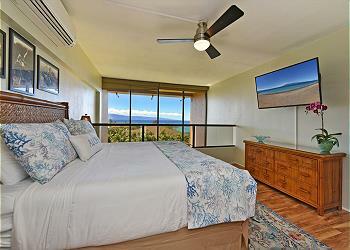 You can watch the surfers at a famous “S Turns” surf break from your balcony (aka lanai). Swim, snorkel or kayak right off the beach during the day and walk to some excellent dining choices at night. Try some local brews at the Maui Brewing Company or fresh local caught sushi at the “Miso Phat” sushi, both within a five-minute walk from the resort. The kitchen is equipped with dishes and utensils for your home away from home experience. The 4th-floor unit offers an ocean view, and we can guarantee you will enjoy some breathtaking sunsets from your balcony. Maui is an incredible Hawaiian island and easy to fall in love with. From the white, red and black beaches to the top of the world-famous Haleakala crater, there are so many things to do and see. Visiting between December and March? You may see humpback whales breaching and playing with their young while enjoying a glass of wine on your lanai.